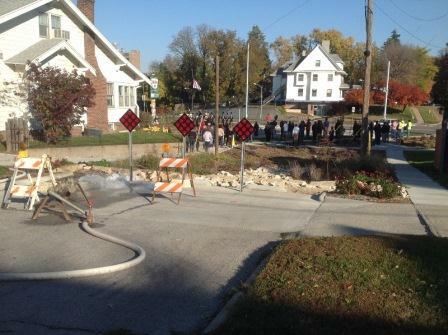 Thank you very much to everyone who came out to celebrate the new Benson East Gateway & rain garden! It turned out to be a great morning to get together, talk with friends, & learn more about this exciting new project. As part of the fun, a contest was held to see who could guess how many gallons of water it took to fill the garden. The official amount was 6,180 gallons. $10 gift certificate/cards for Leo’s Diner, Pizza Shoppe, and Omaha Bicycle Co.
$10 gift cards for Pizza Shoppe and Omaha Bicycle Co.
A big congratulations to our winners…and a huge thank you to Leo’s, the Pizza Shoppe and Omaha Bicycle Co.!